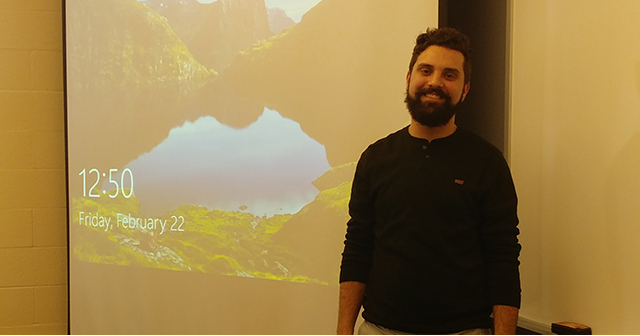 Mechanical engineering student Tanner Cooper ’17 ΔΤΔ returned to his alma mater on Feb. 22 to discuss his experience with Westminster’s dual degree program with Washington University in St. Louis, Missouri. The informal gathering of about 20 students took place in Room 114 of Coulter Science Center. Cooper discussed the types of classes Westminster students in the dual degree program should focus on in order to excel in mechanical engineering. A slide presentation of required course work, diagrams of a thermal network he designed in class for portable homes used in Alaskan disaster relief, and designs and photos of a class portable treadmill project were part of Cooper’s presentation. Following the discussion, Cooper answered questions, which included whether he felt prepared for engineering classes at Washington University after graduating with a degree in mathematics from Westminster. Cooper answered that he was “on pace” with other students in the program. Cooper plans to graduate with both a bachelor’s and master’s degree in mechanical engineering in 2020. While at Westminster, his research during a summer internship on “Feedback Control in Flight Dynamics” earned Cooper the Best Paper prize in the Division of Natural and Mathematical Sciences at Westminster’s Undergraduate Scholars Forum in April 2017. He also was awarded the prestigious Hunter Fellowship to attend Washington University. For more information on Westminster’s dual degree engineering program with Washington University in St. Louis, Missouri S&T in Rolla, or Southern Illinois University-Carbondale, please contact Dr. Peng Yu, Program Coordinator and Assistant Professor of Mathematics, at 573-592-5320 or Peng.Yu@westminster-mo.edu.